In a medium sized bowl, combine eggs, coconut oil, honey, vanilla extract and salt. Once this is mixed, blend in the coconut flour. (Melt coconut oil and honey together in microwave first). Stir in shredded coconut and chocolate chips. On parchment lined baking sheets, drop heaping tablespoons of cookie batter - they will not spread or rise. 351 members have added this recipe to their cookbook. Too many carbs. Might try with a 1/2 cup butter/erythritol mixtute in place of the honey, and a tbsp of psyllium fiber powder to bind the ingredients together. Also eliminate the coconut and reduce the chips. Should bring the carbs way down. too much sugar for me! These cookies were very tasty but I also found them very crumbly. After doing some research on coconut flour, I found out that it is very dry and soaks up liquid like a sponge. I will try this recipe again but next time I will add some milk and see how that works. This recipe was a good idea but failed on so many levels. I have never worked with coconut flour before, but the dough was so crumbly you couldn't even scoop it on to the cookies sheet, and they tasted horrible. My husband said it was like eating chalk. The cost of the ingredients to is way out there. I think with a little reworking it would be an okay cookie but the way it is now. I am not ever making tham again. Best Paleo cookies I've tried. I'm doing the Paleo diet and all items in this recipe are compliant. Not exactly a normal cookie but still really yummy with that sweetness I've been craving! Quite simply the best cookies in the world - certainly not diet food. A lighter revision of peanut butter cookies. 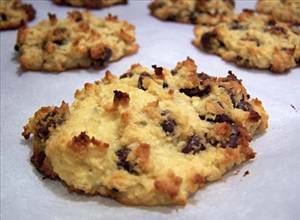 There are 81 calories in 1 serving of Coconut Chocolate Chip Cookies. Calorie break-down: 52% fat, 41% carbs, 8% protein.